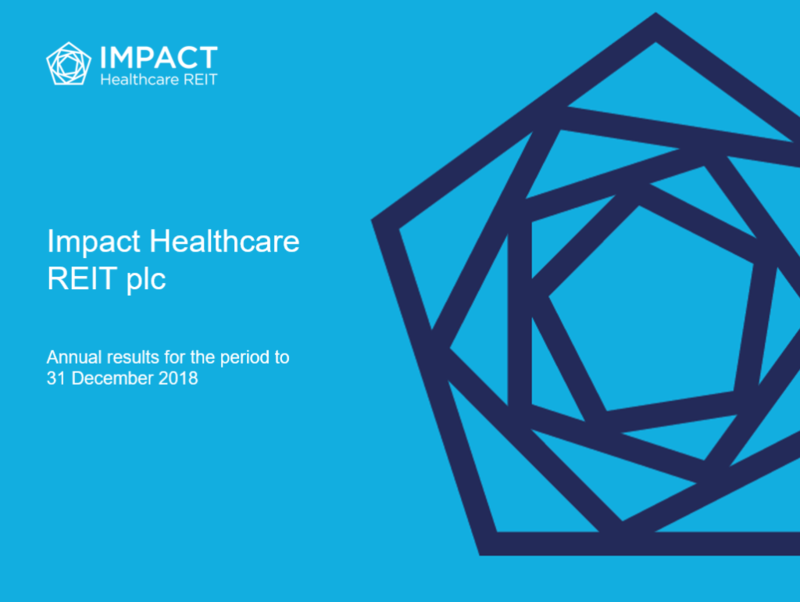 The board of Directors of Impact Healthcare REIT plc (ticker: IHR) (the “Board“), the real estate investment trust which gives investors exposure to a diversified portfolio of UK healthcare real estate assets, in particular care homes, is pleased to announce that on 15 March 2019, the Group appointed Impact Health Partners LLP (“IHP”), the Company’s existing investment adviser, as the Company’s Alternative Investment Fund Manager (“AIFM“) and investment manager replacing Carne Global AIFM Solutions (C.I.) Limited (“Carne“) as the AIFM. IHP will now provide discretionary portfolio management services to the Company. In order to maintain an independent risk management function, IHP has delegated responsibility for risk management to Carne. As it is expected that the investment manager will not be required to charge VAT on its fees payable by the Company under the new arrangements, the change will result in a net cost saving for the Company after taking into account the additional costs of the new Depositary. The Company complies with the Listing Rules in respect of transactions with the existing investment adviser, IHP. This transaction with IHP is deemed to be a smaller related party transaction within the definition of the Listing Rules. A summary of the new management arrangements and the old management arrangements are set out below in the Appendix. 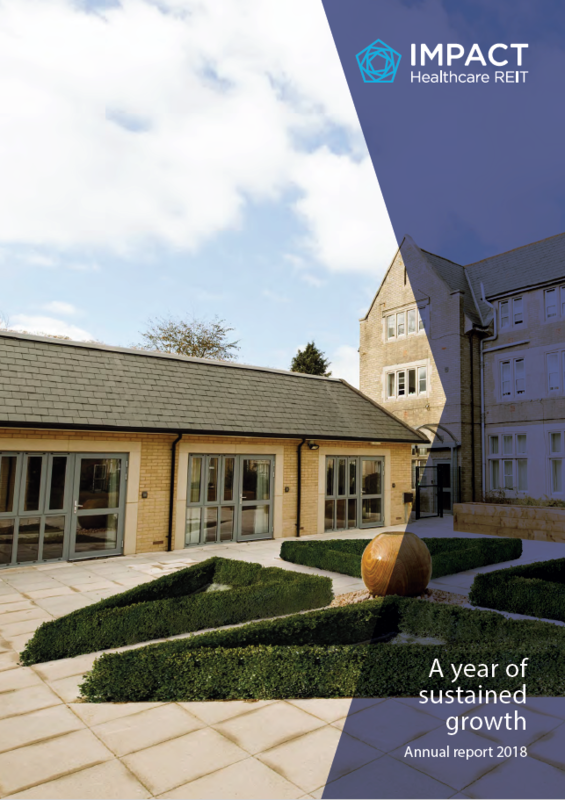 The Company’s previous management arrangements are set out on pages 72-74 of the prospectus published by the Company on 11 February 2019 (available on the Company’s website: https://www.impactreit.uk/investors/reporting-centre/prospectus). Fees payable to IHP by the Company (the “Advisory Fee”) were subject to VAT. In addition, Carne was entitled to a management fee of £95,000 per annum together with reimbursement of all costs and expenses and disbursements. On 15 March 2019, IHP became the Company’s investment manager and AIFM pursuant to an investment management agreement. IHP has recently become regulated in the conduct of investment business by the Financial Conduct Authority (“FCA”). IHP is now, for the purposes of the Alternative Investment Fund Managers Directive (“AIFMD”) and the rules of the FCA, a “full scope” UK AIFM with a Part 4A permission for managing AIFs, such as the Company. IHP will continue to receive fees equal to the Advisory Fee it previously received. The Company has been advised that the fees due to IHP as AIFM will be exempt from VAT. 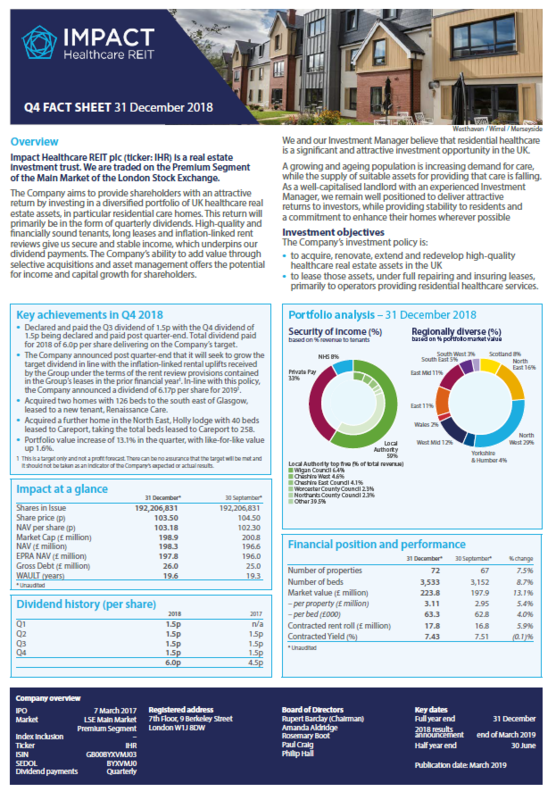 In addition, IHP will receive the £95,000 per annum fee previously paid to Carne, from which IHP will be required to pay Carne a fixed annual fee of £57,000 (plus VAT) for the provision of risk management services which have been delegated to it under the terms of the new investment management agreement. The Company will continue to own and hold all of its current assets. Under the old management arrangements, the Company was not required to have a Depositary as Carne is a non-EU AIFM. However, as IHP is a full scope UK AIFM, the Company is now required to appoint a depositary in accordance with the AIFM Directive. The Company has appointed INDOS Financial Limited as depositary which is authorised and regulated by the FCA (the “Depositary”) pursuant to a depositary agreement (“Depositary Agreement”). Under the terms of the Depositary Agreement, the Depositary is entitled to a base fee of £30,000 per annum, an additional 0.01 per cent. per annum on the next £300 million of new equity capital raised and 0.005 per cent. per annum on any further new equity capital raised. The Depositary is entitled to reimbursement of all reasonable out-of-pocket expenses properly incurred in connection with its duties. The Depositary is entitled to charge an additional fee where the Company undergoes a lifecycle event (for example, a reorganisation), which entails additional work for the Depositary. Such fee will be agreed with the Company on a case by case basis. These fees are exclusive of and will be subject to VAT.